Attending a local festival or being in a country during a national holiday are great ways to dig deeper into the culture. But you don’t always need to travel to the place you think in order to join in on a specific event. For example, one of the biggest St. Patrick’s Day parades is held in Chicago and there are Bastille Day celebrations all over the world, not just in France. Likewise, while it would be great to celebrate Cinco de May in Mexico, it’s not the only place to have a good time on May 5th. In fact, Cinco de Mayo is really only celebrated in one place in Mexico – the state of Puebla. The holiday commemorates the date when the Mexican army defeated the French in the 1862 Battle of Puebla. On this date, you’ll find festivals of food, music, and dancing throughout Puebla, but not much elsewhere in Mexico. Cinco de Mayo is almost a bigger deal in the US, where people use the holiday as an excuse to eat their favorite Mexican food, drink margaritas and don a sombrero. Chicago’s southside neighborhood of Pilsen is home to a large Latino population, and hosts a free parade every year. The many Mexican restaurants (some of which are BYOB, so you can save money on your Dos Equis or Tecate) also host Cinco de Mayo parties. New York seems to have a party for just about everything, so it’s no surprise the city gets down for Cinco de May as well. You’ll find a Cinco de Mayo party at nearly every Mexican restaurant and there’s a weekend parade near Central Park. The San Marco Cinco de Mayo party includes a parade and a Miss Cinco de Mayo (and Little Miss Cinco) pageant plus music and dancing, tons of food and menudo (a type of Mexican soup) cooking contest. 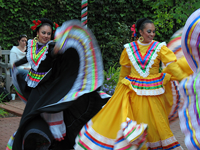 Los Angeles is home to the biggest Cinco de Mayo street fair. Head to Broadway in downtown L.A. or to the historic Plaza del Pueblo de Los Angeles at Olvera Street for traditional dances, music, and kids’ activities. Celebrate National Cherry Blossom Festival in Washington, D.C.
mTrip Travel Guide allows you to share postcards Offline while you travel Budapest: The New Paris of the 20s?